Lagos, Nigeria, 16th September, 2013: The Nigerian government has set a target of generating 10,000 megawatts of electricity by the end of 2013 and 40,000 megawatts by 2020 to combat the growing power crisis in the country, according to recent reports. With a population of over 170 million and generation capacities hovering between 3,000 – 4,000 megawatts, Nigerians are among the most deprived of grid-based electricity in the world, with a per capita consumption that is far lower than many other African countries. Further reports suggest that the state of electricity supply has put the Nigerian economy in jeopardy and forced many residents and businesses to relocate to neighbouring countries with stable power supplies. With the global renewable energy sector witnessing a sudden boom, the Nigerian government is also looking to embrace its huge renewable energy resources such as solar energy, small hydro, biomass and wind power, in a move to generate uninterrupted power supply in the country. To help fulfill Nigeria's power generation needs, more than 100 companies from around the world will convene in the country's largest city, Lagos, next month at the second edition of Power Nigeria, taking place from 2-4 October at the Eko Hotel and Suites. The three-day exhibition will serve as a comprehensive showcase for the power generation, transmission and distribution, lighting, new and renewable energy, nuclear energy and water sectors. The 2013 edition features a notable line-up of exhibitors including Phenix Technologies Inc, NAFFCO, Hindustan Vidyut Products Ltd, Gulf Advanced Lighting LLC, Power Engineering Ltd and Mars Energo. They will be joined by local Nigerian companies including RAP Power Industries Ltd, AVSCO Nigeria, Fullmark Urja Ltd, Clarke Energy and Vachi International who will showcase their products and services to key industry decision makers in the country. An interesting feature of the exhibition is the free to attend technical seminars, hosting an esteemed panel of industry experts from around the world who will highlight the latest developments in the energy sector and discuss key energy issues Nigeria faces today. Rajesh Kumar Khanna from HPL India Ltd will be among the first speakers in the morning of the three-day seminar, who will introduce participants to some of the latest electrical products from HPL India. Also speaking will be Nikolay Gotsev from International Power Supply Ltd (IPS) who will talk about hybrid off-grid systems and solutions and discuss the future of the Nigerian power sector. The seminar will culminate with a presentation about gas engines for captive power and IPP. Power Nigeria is supported by The Nigerian Association for Energy Economics and The Foundation for the Development of Africa. The event is partnered with Africa Electricity, Power + Water Middle East, Middle East Electricity and Solar Middle East. 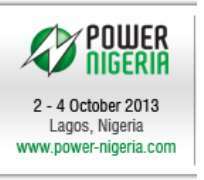 For further information about the visit www.power-nigeria.com or call: +971 4 336 5161.